1. 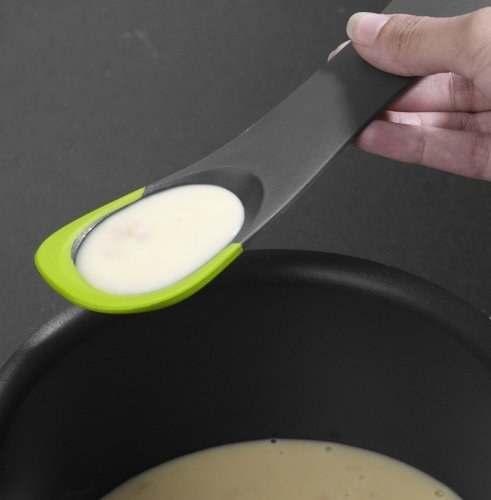 A lazy cooking spoon that'll eliminate your need for a spoon rest so you don't have to wash another dish just to keep your counters clean. 2. A splatter guard so you can fry your favorite foods without having to scrub every inch of the kitchen afterwards. Promising review: "I have wanted this for years and so glad I finally purchased it! Love my home-made tacos but not the clean up. This splatter guard helps keep most of the stove top clean and splatter free, yea!" —Twila B. 3. Reusable non-stick oven liners to keep your oven nice and clean by catching any juices and crumbs that fall while baking. 4. A 7-in-1 Instant Pot with tons of time-saving features so you can make a delicious meal and get away with only cleaning one pot. 5. A four-in-one vegetable chopper that'll keep your kitchen tidy during meal prep. Liquids won't drip off the side of your cutting board, veggies won't fly across the kitchen, and you can easily transfer them from the container to the pot. 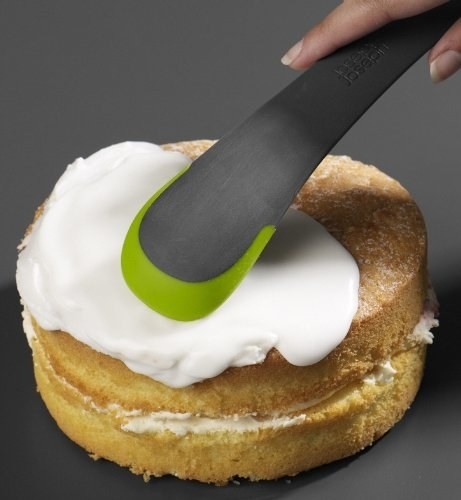 This comes with three interchangeable blades for dicing, chopping, and slicing. You can also use this to keep your prepped vegetables fresh in the fridge until you're ready to cook with them. Hand-washing is recommended, but you can also wash this in the top rack of your dishwasher. 6. 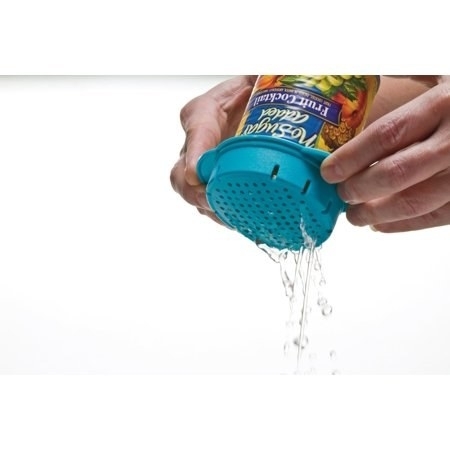 A small can colander so there's no need to dirty a big one just to drain canned veggies for your fave recipe. 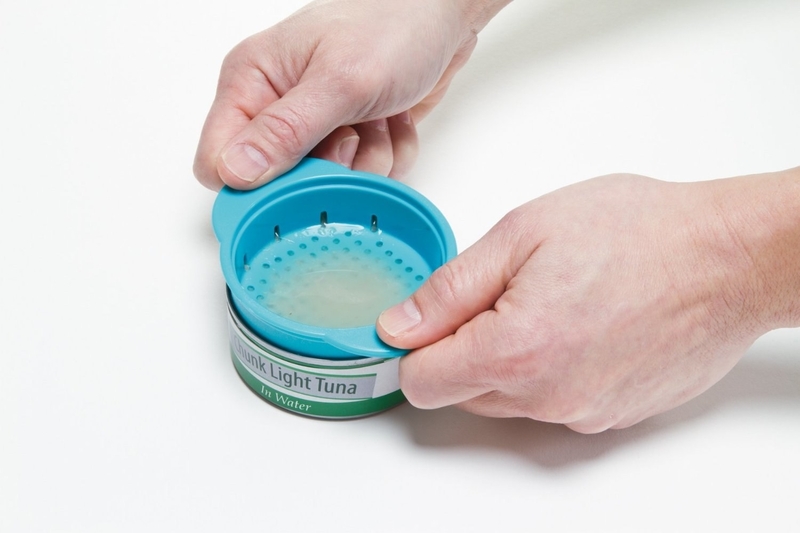 Plus, it keeps your sink cleaner when preparing food like canned tuna because little particles won't be running wild all over the place! 7. An 11-piece non-stick cookware set from the BuzzFeed Tasty collection that's dishwasher-safe — meaning you can toss them in the dishwasher after cooking and not have to worry about a sudsy mess. 8. A cutting board with color-coded mats that'll let you chop your favorite foods without the worry of cross contamination. When you're finished cooking, just wash the mats and you're done! 9. A kale, chard, and herb stripper that won't *kale* your cooking vibe because there will be minimal mess and dishes to clean up afterwards. 10. A multi-section pan for cooking a bunch of different foods without dirtying tons of dishes. This 15" non-stick pan is dishwasher and oven safe up to 350 degrees. 11. 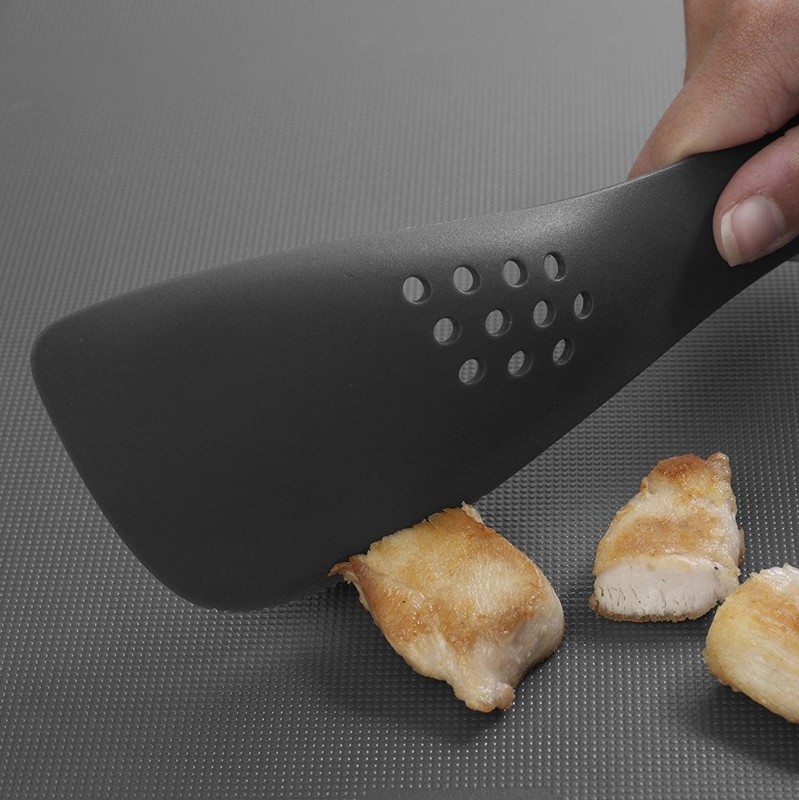 A multi-use utensil that has five different functions, so no matter what you're making, you'll only need to wash one cooking tool. This jack-of-all trades uni-tool can be used as a slotted spoon, solid spoon, turner, cutting tool, or spatula. 12. A food scale that'll give accurate measurements so you can nail that recipe...and so you can dirty one fewer measuring spoon. 13. A Scrub Daddy sponge to clean up your mess with ease. It actually changes texture depending on the temperature of the water so you can knock out all kinds of tough cleaning jobs. 14. 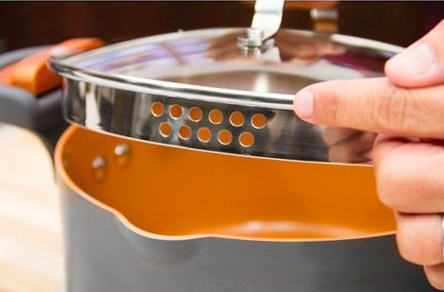 A pot with a handy strainer lid for easily draining your pasta — no need to even think about dirtying a colander! 15. 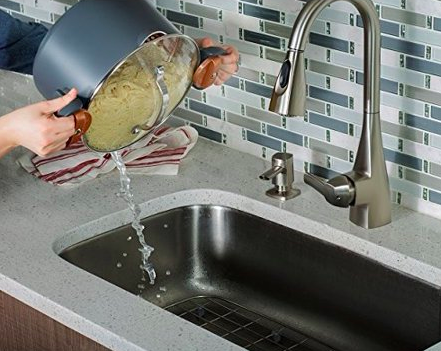 Or a pot strainer clip if you like your current set of pots but still want to solve your "I hate washing my colander" issue. 16. A countertop trash can to make the clean-as-you-go method even more efficient. 17. A foldable cutting board that'll help you prep your favorite stir fry dish and ensure your veggies make it into the pan, instead of onto the floor. 18. A non-stick silicone mat so you can say goodbye to the days of scrubbing burnt cookies and crumbs off your pans. 19. A boil-over safeguard to prevent your pasta water from overflowing, burning your stove top, and giving you yet another cleaning task. 20. A gap cover so you don't have to spend time cleaning out all the crumbs and sauces that fell into the awkward space between your counter and your stove. 21. And lastly, Mrs. Meyer's dish soap that'll use its plant-derived formula to break down grease and make it disappear with zero effort. Plus, the delicious smell of lemons will soothe you as you do your least favorite chore. Make your life even tidier. Check out some of the best all-natural cleaning products for your home, the best bathroom cleaning products, organization products perfect for neat freaks, and, of course, our ultimate guide to cleaning every single room in your house.